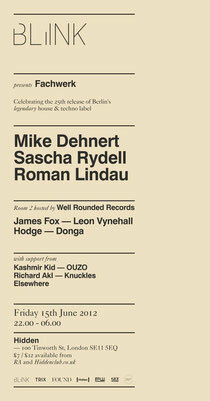 Blink has invited Berlin house and techno imprint, Fachwerk, to host the London leg of its European tour celebrating the label’s 25th release. 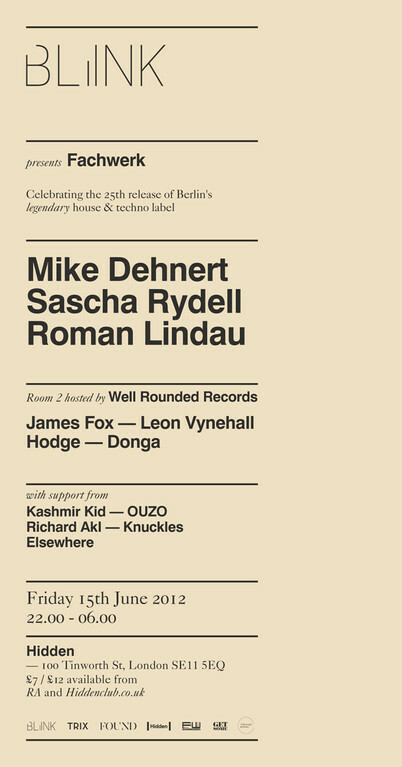 Taking place on Friday 15th June at Hidden in London, Mike Dehnert’s label has now been pushing raw, industrial, rugged techno and analogue-polished house 25 records strong. Its heavy and hard-hitting output has enjoyed nights at the world famous Berghain and on June 15th brings its sounds to London alongside fellow label cohorts, Roman Lindau and Sascha Rydell. After pioneering the likes of Julio Bashmore, XXXY and Deadboy’s seminal ‘U Cheated’ EP, Blink invited the current cream of Well Rounded Records crop in the form of James Fox, recent ManMakeMusic signing Leon Vynehall, label founder himself Donga and latest signing Hodge with support from London’s Liminal and GetSome residents.